First, Peter, tell us a little about you. I am a full-time freelance game graphics designer based out of Minneapolis. I attended the Minneapolis College of Art and Design (MCAD) with a BFA in Illustration and graduated in 2005. I love playing games, reading books, and hanging out with my wife Lisa. So, how did your career as a graphic artist develop? What sorts of non-gaming projects or work are typical for you? While attending MCAD, I was primarily focused on illustration, particularly physical media such as acrylics, pens, charcoal, markers and anything else that would visually work on whatever assignment I was currently on. After school, I was hired by Polaris as a paid intern doing surface design. That meant that I was working on decals for ATVs, snowmobiles and some other side projects. It was one of the first times I used the program Adobe Illustrator to create vector images and I got really excited about how much more I could digitally manipulate my ideas. After my internship I decided to be a freelancer and was hired to do some convention graphics for Polaris. I did a few other random jobs but decided that I didn’t like hunting down leads for new work and decided to get a full time job at a book bindery. I soon realized that glue fumes were not a great long term, healthy solution and worked my way over to the pre-press side of the operations. There I learned a lot about Adobe Acrobat and InDesign, which eventually helped me secure a job at Best Buy HQ as a Production Artist doing primarily in-store signage. Best Buy helped me get a lot more familiar with InDesign and also a bit of Photoshop. During this time, I was still doing random graphics projects including a couple of books, FunThink and ARTHINK. How about during your education or formative years in the profession, was there a particular artist’s style that inspired you or informed your own work in graphic design? 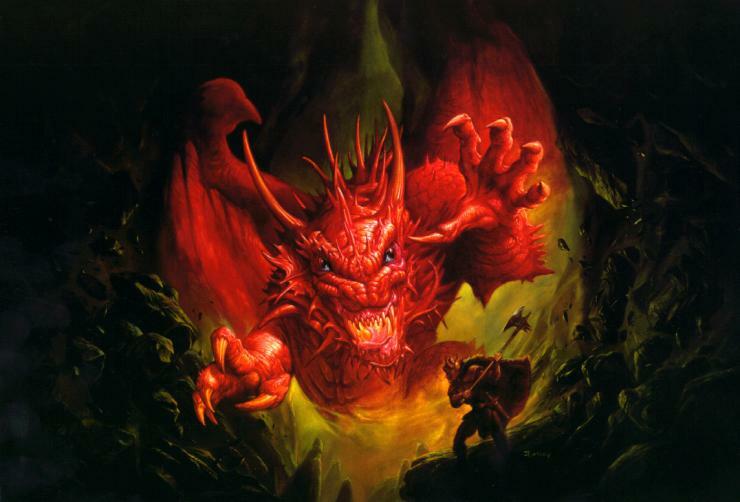 The most inspirational artist and piece of art to me has been Jeff Easley’s Red Dragon (link). The piece was so well executed and it sparked my imagination. I even wrote an essay about it which was required along with a portfolio to be accepted at MCAD. I’m proud to say that I was able to meet Jeff at GenCon 2014 and now have a signed print hanging in my office. It brings me excitement and a sense of adventure every time I see it, which is multiple times a day. So how did you then make your first inroads into the gaming industry? After Best Buy went through some downsizing, I was out of a job. Rather than jump at the first opportunity to present itself, I took some time to do a bit of career planning with the help of my wife Lisa. I realized that I didn’t want just any old job, I wanted to do something that I was passionate about. Some of my regular gaming group worked at Fantasy Flight Games and I thought that working in the game industry would be a lot of fun. I started at FFG as an Intern and was quickly hired over to the Marketing team! While working on the Marketing team, I was busy re-skinning websites, creating Organized Play kits and doing a bunch of flash banner ads for Board Game Geek, as well as a host of other projects. We cranked out a lot of awesome projects and I learned a ton about the hobby game industry. After two years of marketing graphics, I transferred over to a Game Graphic Designer position internally at FFG. After FFG, my wife and I moved to Nice, France, for a year and a half and it allowed me to really take off as a full-time freelance designer. I was hired by Plaid Hat Games to work on some projects such as BioShock Infinite: The Siege of Columbia, City of Remnants and a complete overhaul of their website. I also started working with Floodgate Games on Legacy: Gears of Time, as well as a variety of other game companies. After the work with Fantasy Flight, how did you get connected with the other publishers? How did they “discover” you? The primary way that I establish relationships with other game companies is to meet them at a convention and make sure that I follow up with them after I’m back in the office. I’ve been fortunate enough to be a member of the Plaid Hat Podcast, and show up every five or six weeks, and I know that I’ve made initial contact with clients through my association with the podcast. LinkedIn and Twitter have also been successful. Total, how many board games have you done work for? According to my Board Game Geek profile, I’m at 27 games and expansions. That’s not an entirely accurate number, since board games take so long to develop from where I’m working on something in-progress until the final product shows up on an FLGS new releases shelf. Right now I’ve got seven games in progress that haven’t been announced plus another six that are at the printer or are waiting for KickStarter. Do you have a personal favorite? Or one that you felt was rewarding because it challenged you to do new things? The two games that are easy to mention would be BioShock Infinite: The Siege of Columbia and Lagoon: Land of Druids. Both games were quite a bit of work but the final product is even better than I imagined they could be. How does designing for tabletop games differ from other work, such as marketing projects? Okay, for those who may not know (and thinking solely of our readers here, of course! ), what do RGB and CMYK stand for? RGB stands for Red Green Blue. It’s what computer screens and monitors use to display images. Each pixel is made up of three little lights, a red, green and blue one. By each light displaying a combo of the three lights simultaneously, they can make pretty much any color imaginable. CMYK stands for Cyan Magenta Yellow Black. Those are the four colors of ink that they use in almost every print shop. By combining different levels of each ink, shops are able to make quite a few colors, but you start to run into limitations. For example, the color white is generally translated by the absence of inks. That means if you want to print on non-white paper or, say a piece of grey chipboard, the colors are going to look funky because they don’t have a base of white that it’s printing on. Any file that’s going to press is going to look different on my screen versus what the final product looks like. Any board games that I work on need to be lightened about 10-15% because they naturally darken after printing, especially when the sealants go over the inks. There are also a bunch of other fiddly elements that you need to look out for when you’re going to press, such as rouge RGB files that have Russian nesting-dolled into an image that’s linked in a PDF; or art that is too low of resolution. Of course there’s always bleed that needs to be added to anything that prints or else you’ll end up with some white paper showing through on a piece of punchboard if it’s not perfectly cut. Hint: it’s never perfectly cut. For marketing projects, sure, you may also be dealing with CMYK files for printing off convention banners or organized play kits, but for the most part, it’s more about designing an asset to be X by Y pixels. There are still rouge elements that can always show up like a couple out of place pixels that are hanging out on a light background. The biggest difference to me is that in marketing, you’re using a lot of pre-existing visual elements that were designed for the board game, so it’s less graphic art and more graphic design. Alright, so Artist’s Valley ostensibly looks at illustrators. But there’s a distinction between that and your work. Explain to our readers a little bit exactly what you do – how graphic design differs from the process of creating original illustrations? Here’s the distinction that I see between artist/illustrators, graphic designers and graphic artists. I would lump artists and illustrators into the same category when it comes to board and card games. They are primarily responsible for illustrating unique card art, cover art, unique boards and tiles, etc. Graphic artists are generally in charge of the graphic design, but we are also creating a lot of unique design elements such as card borders being more than boxes, logos that are more than a font with beveling or embossing, and generally making sure that the final product feels like it’s part of the same game system. Primarily, it’s about using your best judgment to help birth the game designer’s vision and deliver a healthy, good looking game. A lot of people who are credited as graphic designers are actually graphic artists. But a pure graphic designer would just be making sure that the right art went to the right cards and that the text and formatting were clear and precise. They would also lay out the rule book based on pre-existing design elements, punchboard and a lot of other tasks such as making sure there aren’t any RBG files or un-embedded fonts in the press-ready game files. Of course there’s a lot of overlap between all the positions. Many hats must be worn by various team members. When working on a board game, do you take any direction or artistic suggestions – maybe even some requirements – from the game’s designer/publisher? How much of a “free license” do you have? Every project is different. Sometimes the art is already done. Sometimes the illustrators hired have very different visual styles and it’s more of how to wrangle the visuals into a cohesive package. I’ve been hired to work on a game before they’ve even hired artists, and given my two cents on which ones I liked or did not. Depending on how prepared the client is, sometimes they’ve already created a visual style guide of what they imagine the visuals are going to be. And sometimes, I have complete autonomy to create the look and feel of the game. I would say that I can work with a lot of different ways of approaching a game, but my favorite is complete autonomy. That way, the game designer gives me the pitch of the game and the prototype and rules and I come back to them with some concept sketches. It starts a dialogue and each of us brings our imagination to the table. The final result is generally greater than the sum of its parts. Anything interesting about the relationship between illustrators and graphic artists? Do artists have much say in how their work is implemented once they send it to the publisher? Sometimes, if the art doesn’t look right or doesn’t have bleeds built in, I may need to go into an illustration and add some work to the edges so that when the card is cut, there’s not the potential of a white strip on the side. There’s also a lot of changing the art from RGB to CMYK and then tweaking the levels or contrast because some of the detail may have dropped or gotten muddy looking. Generally my interaction with the artist on a project would be designing a card template and then sending an email about how much active and bleed space are needed for the illustrations. In general, since I’m a one man company, I try to stay out of the art director side of things for artists. That could be a full time job in itself. I trust that the artists being hired are professionals and that the publisher knows what they’re doing. What comparable work in the hobby? Are there any specific game illustrators you know of who’s work you particularly enjoy? One guy I always look forward to seeing is Wayne Reynolds. He has a very unique style and the illustrations are always exciting and filled with adventure. Cory Godbey and John Ariosa’s recent work on Tides of Infamy has also been exciting to work with. Do you still get to do any traditional illustration or art, even if just for fun? I’ve been blessed with a fair amount of board game graphic design projects, so that helps scratch my creative itch. Plus, I’ve found that if you work in a creative field as your day job, it’s more difficult to psych the brain up to pump out more creative content on nights and weekends. I do still keep a sketchbook for all of my projects and that helps me still work with some physical media, although sometimes if I want to erase something, I find my hand going to an invisible keyboard to hit [command]+[z]to undo. It’s a great reminder that I’ve been spending too much time on the computer! Taking time out for some personal drawings! If you could choose one theme or subject for a future game that you have not dabbled with before, what would that be? I would LOVE to work on a Hellboy game or something set in The Dark Tower series by Stephen King. I know that’s two themes/subjects, but I make no apologies! You mention being a gamer yourself. What do you usually play and what are some of your favorites? I used to play quite a few RPGs, mostly D&D and Pathfinder, although my regular group has evolved into more of a board game group. My wife and I play quite a few games, with a lot of Star Realms, Lost Cities, Balloon Cup and Lords of Waterdeep hitting our table. I also keep up with some friends digitally with games such as Disc Drivin and Summoner Wars. Minneapolis/St. Paul has a pretty robust network of game companies, game stores and gamers, and I try to stay connected to the latest “hotness” as it’s super important to know what’s resonating with players and why. And finally, I ask this of everyone in the series whether they call themselves “artist” or not; what do you do for inspiration? Any habits or particular place you go to before working so that you can “get into the zone”? I try to keep a regular work schedule and disconnect from work on nights and weekends, but that’s tough to do since my hobbies are also generally game related. Sometimes that leads to a bit of creative slumps, but I’ve found that the main reason I hit inspirational barriers is if I haven’t been exercising or at least getting outside on a regular basis. I’m blessed to live within walking distance of a chain of lakes and a small forest, so I try to go kayaking or on a walk every day. Nature is jam-packed with exciting designs and tons of cool details. I do keep the Spectrum series of books close at hand as a reminder of how much talent is out there. I have also found that when I go online for inspiration, it’s a double-edged sword. There’s tons of great inspirational and educational content there, but it’s very easy to get side-tracked and end up browsing down the rabbit hole only to realize that three hours have passed and I’m now caught up on Key & Peele or have held a couple of Twitter conversations and caught up on all of my BGG notifications. In recent years, I’ve been very impressed by the level of quality that has been making it into board and card games. I think one thing that holds back the floodgates to more exciting illustrators is that there are still quite a few companies that don’t pay enough per illustration to allow artists to make a livable wage. Peter raises a number of exciting points, but I’ll focus on the end of the interview where he briefly mentions pay disparity. As a game developer, I’ll often have conversations with my designers on how to move forward with artwork, and that can be a touchy subject for a number of reasons. Most notably, indie, self-published games through a venue like Kickstarter or Indiegogo often lack the financial resources for great art. Additionally, what one artist might render for $50-$75 might insult another artist who wouldn’t touch a project for less than $500. While FFG and Days of Wonder can certainly shell-out much larger amounts to their artists and illustrators, it’s much more difficult for your typical designer.